Congestion in the first 24 hours: This stage is characterized histologically by vascular engorgement, intra-alveolar fluid, small numbers of neutrophils, often numerous bacteria. Grossly, the lung is heavy and hyperemic. Red hepatization or consolidation: Vascular congestion persists, with extravasation of red cells into alveolar spaces, along with increased numbers of neutrophils and fibrin. The filling of airspaces by the exudate leads to a gross appearance of solidification, or consolidation, of the alveolar parenchyma. This appearance has been likened to that of the liver, hence the term "hepatization". 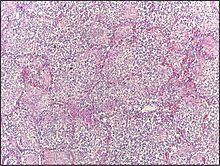 Grey hepatization: Red cells disintegrate, with persistence of the neutrophils and fibrin. The alveoli still appear consolidated, but grossly the color is paler and the cut surface is drier. Resolution (complete recovery): The exudate is digested by enzymatic activity, and cleared by macrophages or by cough mechanism. Enzymes produced by neutrophils will liquify exudates, and this will either be coughed up in sputum or be drained via lymph. The most common organisms which cause lobar pneumonia are Streptococcus pneumoniae, also called pneumococcus, Haemophilus influenzae and Moraxella catarrhalis. Mycobacterium tuberculosis, the tubercle bacillus, may also cause lobar pneumonia if pulmonary tuberculosis is not treated promptly. 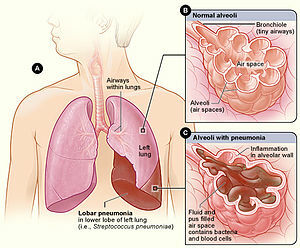 Other organisms that cause lobar pneumonia are Legionella pneumophila and Klebsiella pneumoniae. On a posterioanterior and lateral chest radiograph, an entire lobe will be radiopaque, which is indicative of lobar pneumonia. Chest radiograph of a lobar pneumonia, affecting the right middle lobe. ^ a b Cotran, Ramzi S.; Kumar, Vinay; Fausto, Nelson; Nelso Fausto; Robbins, Stanley L.; Abbas, Abul K. (2005). Robbins and Cotran pathologic basis of disease. St. Louis, Mo: Elsevier Saunders. p. 749. ISBN 0-7216-0187-1. ^ a b Le, Tao (2017). First Aid for the USMLE Step 1 2018. New York: McGraw-Hill Education. p. 664. ^ E.,, Weinberger, Steven. Principles of pulmonary medicine. Cockrill, Barbara A.,, Mandel, Jess,, Preceded by : Weinberger, Steven E. (Seventh ed.). Philadelphia, PA. ISBN 9780323523738. OCLC 1020498796. ^ "Lobar Pneumonia". Retrieved 2008-11-16.